Indian Navy SSC Executive and Education Branch 2018 applications are invited for unmarried eligible male/ female candidates for grant of Short Service Commission (SSC) in the field of Education and Logistics (The application process for Law and IT is yet to start). The unmarried man and women can apply for Short Service Commission (SSC) officer in the executive branch of Logistics & Law Cadres. In the branch of Information Technology and Education, only unmarried men can apply. The candidates must fulfil conditions of nationality as laid down by the Government of India. The application process for Indian Navy SSC Executive and Education Branch 2018 has begun from 20 January 2018. The last date to fill the form is 10 February 2018. The eligible unmarried men will be selected as Short Service Commission (SSC) officer for information technology and Permanent commission officers in education branch for course commencing January 2019 which will be conducted at Indian Naval Academy (INA) Ezhimala, Kerala. Latest Update: Indian Navy has started the application for the field of Education and Logistics only. The candidates can fill the form through online mode. Indian Navy has released the notification regarding the Education and Logistics field. However, the details of the Law and IT is yet to be released. The eligibility criteria for Education & Logistics and Law & IT is given separately below. Before filling up the application form, the candidates are suggested to go through the eligibility requirements. Note: The candidates should not be colour or night blind. The permanent tattoos on any part of the body are not permitted, however, only those candidates who belong to tribal areas communities as declared by the Government of India will get certain concessions. For other candidates, permanent body tattoos are only permitted on inner face of forearms i.e. from inside of elbow to wrist and on the reverse side of palm/ back (dorsal) side of the hand. The application form for Indian Navy SSC Executive and Education Branch can be filled through online mode. Candidates have to fill an online application form to apply for this opportunity. Candidates should keep all the documents ready to upload before start filling the application form. Candidates can click on the following link to fill the online application form. The last date to fill the form is 10 February 2018. The candidates are provided with the steps to fill the online application form. The steps given below will help the candidates to ignore the mistakes while filling the application form. 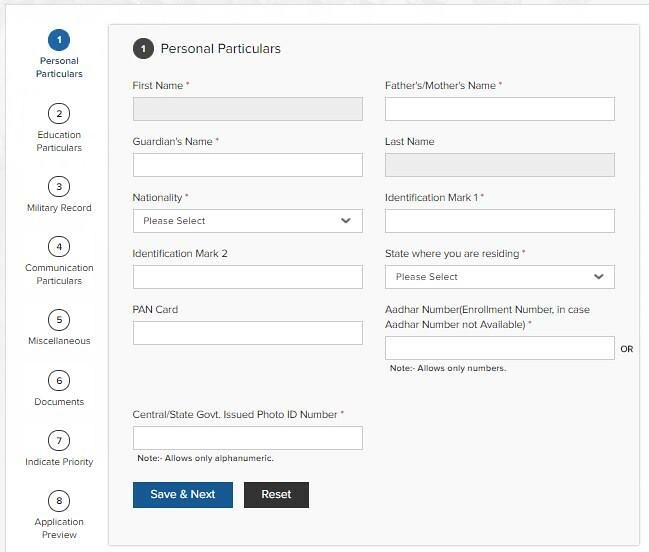 Before filling the online application form, candidates have to fill the registration form by submitting their general details such as Personal Details, Educational Details etc. Candidates also have to provide their email id and create the password to login. The details should be filled up as given in the Matriculation Certificate. After successful registration candidates will get a confirmation email on their given email id, they have to confirm their registration through the link given in the email. After confirmation, they required to log in the website by providing correct Id & Password. Personal & Education Details: Candidates have to fill their personal & educational details in given section. Military Record: Candidates have to provide their military-related records in the application form if any. Contact Details & Miscellaneous: Candidates must submit their contact details such as Contact Number, Email Id, Contact Address etc. and also miscellaneous. Upload Documents: Candidates are required to upload the scanned copy of all relevant documents (preferably original) and a recent passport size colour photograph in the application form. The photograph and documents should be scanned in JPG/ FIIT format for attaching the same while filling up the application. The candidates are suggested to fill the application form furnishing the correct details in every section. The candidates after filling up the form should submit the same on or before the due date. The candidates after submitting the form should keep the printout with them for future reference. Candidates for Indian Navy SSC Executive and Education Branch will be selected on the basis of marks obtained in BE/ B.Tech. IHQ of MoD reserves the right to shortlist applications and to fix cut off. Shortlisted candidates will be informed about their selection for SSB interview on their e-mail or through SMS (provided by candidates in their application form). SSB interviews for shortlisted candidates will be held at Bangalore/ Bhopal/ Coimbatore/ Visakhapatnam from May to July 2018. Such candidates will be informed about their selection for SSB interview on their e-mail or through SMS (provided by candidates in their application form). Stage 1: The stage 1 test consisting of Intelligence Test, Picture Perception and Discussion test will be conducted on the first day of arrival at SSB. Candidates who fail to qualify for Stage 1 will be routed back on the same day. Stage 2: The stage 2 test comprises of Psychological testing, Group testing and Interview will last for 04 days. Successful candidates will thereafter undergo Medical Examination. The duration of stage 2 test is approx. 3 to 5 days. Candidates recommended by the SSB and declared medically fit will be appointed for training as per All India Merit of SSB marks depending on the number of vacancies. Candidates have to carry the printout of filled application form along with the original certificates/ documents while appearing for SSB Interview. Selected candidates will be inducted as the officer in the rank of Sub Lieutenant. Their training is scheduled to commence in end June 2018 at Indian Naval Academy, Ezhimala. The training of selected candidates will undergo 22 weeks of Naval Orientation Course at Indian Naval Academy followed by professional training at various Naval Training Establishments/ Units/Ships. Full Pay and allowances are admissible to the Officers whilst undergoing training. The return AC 3 tier/ AC Chair Car rail fare is admissible for the SSB interview if appearing for the first time for that type of commission in the production of railway tickets. Candidates have to carry the photocopy of the first page of passbook or cheque where the name, A/C No & IFSC details are mentioned while appearing for SSB. Any correspondence regarding change of SSB dates will be addressed to the call-up officer of the SSB on receipt of call up letter. 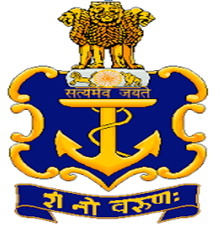 Candidates are to download the call-up letter on receiving intimation from IHQMoD (Navy) at SMS/e-mail (provided by the candidate in their application). Candidates must have completed their degree on the date of filing the application, its mandatory. If, the candidate is eligible for more than one branch/cadre should mention his/her preference in order of priority in his/her application form. A call-up will be issued to the candidates for Service Selection Board (SSB) interviews. If the candidates have not shortlisted for first preference they may be considered for alternate branch/cadre subject to availability of spare slots in SSB batches of that branch/cadre. Change of SSB Centre for the interview is not permissible under any circumstance. No compensation will be paid in respect of any injury sustained as a result of the test during SSB interviews. Group Insurance and Gratuity: Insurance Cover of Rs.75 Lakhs. The gratuity will be granted to the officer as per the latest rules in force. Leave Entitlements: The officers are entitled to 60 days annual leave and 20 days casual leave every year. They will also be entitled to 40% rail concession to any place and free travel for self and dependents. Sports and Adventure: The Navy provides facilities to play various sports.